I seem to be on a kick lately, my new jewelry work all has an ethnic tinge/flair/edge? I just finished two pieces I absolutely love that I’ve been planning since before the holidays. When I create new work part of the process is the collection of the bits and pieces that will go into what I see in my head. In this case two of my china bone dishes sat on the work bench in the studio for almost two months, one heaped with copper things and amethysts and the other with silver birds, clear beads and clear crystals. Sidebar: Old china bone dishes are great. I love them and I promise I’ll stick in a picture of the work table tomorrow with the lazy susan and the dishes. 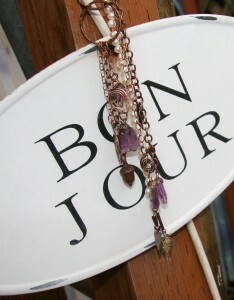 I find them at second hand stores and drag them home to stash beads, findings and bits. Far prettier than plastic or cardboard and they completely fit into my reuse/repurpose esthethic. I was happy last week when I got Christmas packed away and the last of the glitter vacuumed up and the decks cleared for Rhiannon and Gwenlaise. Amazing how long it takes to restart the engines after the holiday but I’m on track and in the studio full speed ahead. 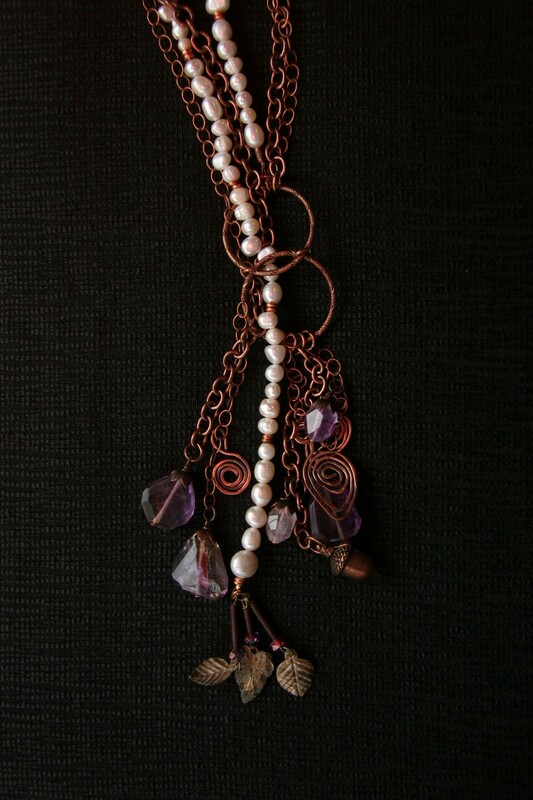 Detail of the cascade on “Gwenlaise”, copper, amethyst and pearls. Love the ribbon tie! Sparkly like clear water, bling with panache! The first piece I finished was Rhiannon of the Birds. I posted a page last week with the story of Rhiannon, a Welsh goddess, and a couple of shots of the piece. 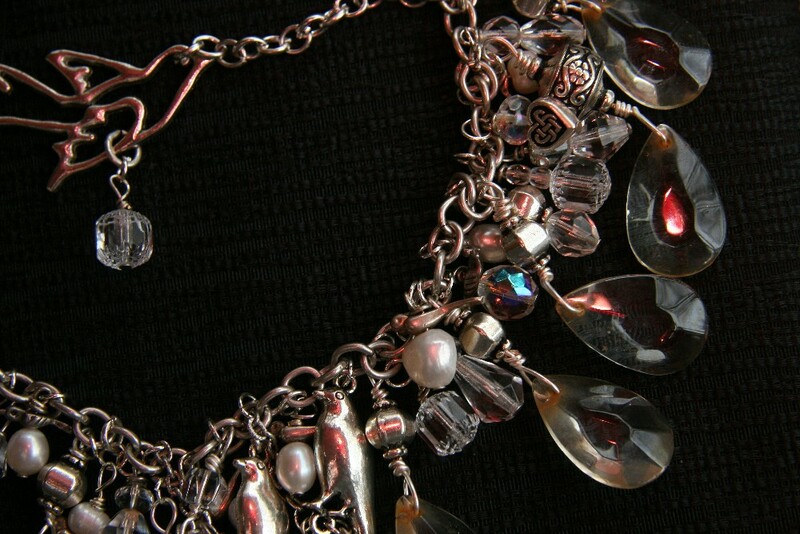 I think its one of the most feminine pieces I’ve made and I love, love, love it. The colors are neutral. 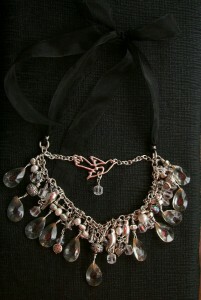 The silky ribbon it ties with is black and everything else is either silver, pearls, or clear. I am reposting a couple of better pictures with some of the details. It is now resident at Matter Gallery in Olympia at $120.00 . Closeup showing birds, crystals and pearls. The second piece is called Gwenlaise, and its one that I’ve been planning for a long time. I love Scott Cossu’s music and his gorgeous jazz/new age tracks have been a big part of the soundtrack of my life. Gwenlaise is the name of my favorite piece of Scott’s music. It’s lyrical and haunting and I actually wore out the original cassette of the album it was released with. Gwenlaise is my thank you to Scott for something that inspires me and takes me somewhere else in time and space. I didn’t realize for a long time he actually lived in Olympia and I have been lucky enough to meet him several times and say thanks for the joy his music brings me. purple heather, and I chose copper to set off the stones and as homage to the beauty of old Celtic jewelry and patterns. 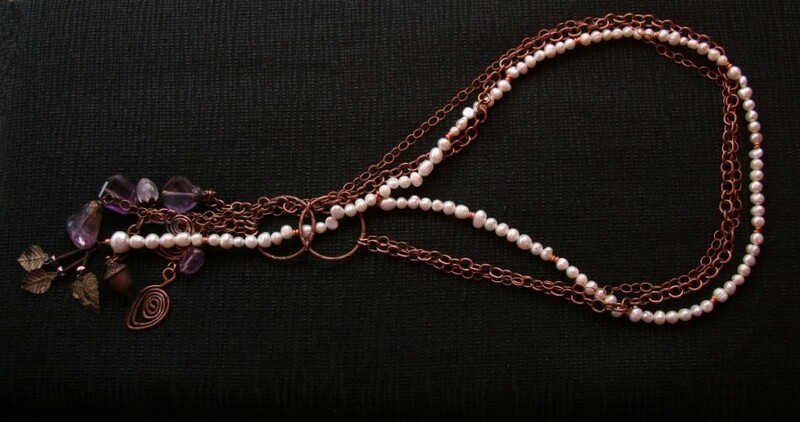 The necklace is constructed as a lariat so it can slide up or down and be worn as a choker with a cascade of amethyst and copper or as a longer necklace. 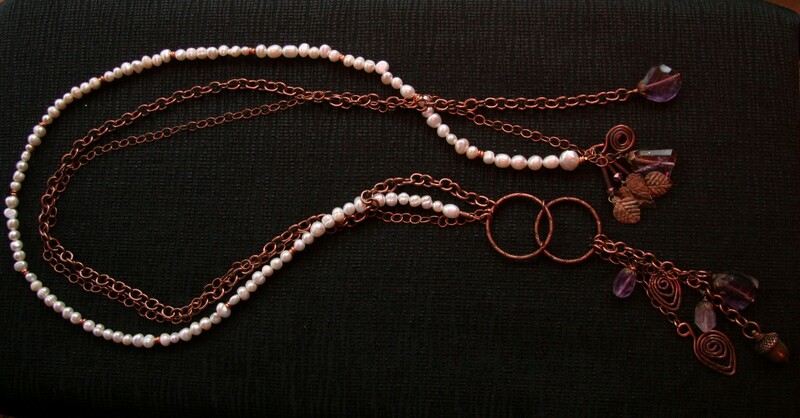 I love the fact that I can just thread the copper and pearl chains into the brushed copper loop. Easy on and off–another one of my “things”, it’s priced at $120. http://www.matteroly.com/Matter_Gallery/WELCOME.html is the webpage for matter. Wonderful artists, fun things. Next out of the studio for me. Mexican Valentine’s necklaces. Glass, red hearts, old images, So fun! and so inexpensive….stay tuned…. This entry was posted in Rabbit's Makes Art on January 16, 2011 by rox.